We need to stop the chemtrail spraying of Los Angeles County and the entire state of California ASAP! Chemtrails, Chemical trails or Aerosol spraying, are a very real threat to Los Angeles County, and humanity on a global scale and must be stopped.
' Why is this being done? I think someone in the federal shadow government has bought into the global warming panic. I uncovered a government proposal to block out one percent of the suns rays from reaching Earth. However, it seems the government overlooked the possible long-term effects of this on the environment and on our health . If you add up all the chemtrail clouds being sprayed all over the world, it probably does block out one percent of the suns total rays, if not more. This being said, it would seem that this sun-blocking proposal is not just a proposal, but has actually been implemented . I do miss my afternoon sun on many days as of late. It was so nice to have the clear blue skies that we used to have. I've always felt that Los Angeles is the chemtrail capitol of the world. It gets really bad here. I worry for everyone, sometimes I feel that all is have left is peace in my heart and my love for everyone. Daily, I practice kindness to complete strangers, Their smiles and gestures is all I need sometimes to get me through the day. "They" may trick me, fool me and even slowly kill me, but "they" can never take what resides in my heart and soul and can never stop me from spready love and hope as chemtrails covers our skies. 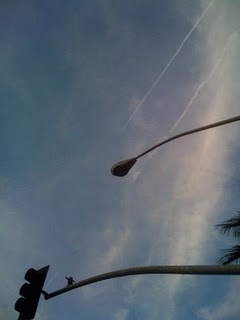 Why Are They Spraying Chemtrails in Santa Monica, California? I live in Marina del Rey and typically skateboard around the Venice/Santa Monica areas. 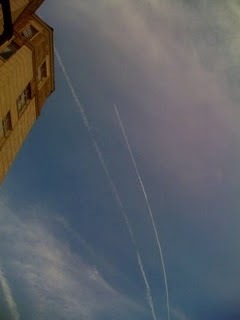 For the last couple of weeks, there has been a lot of chemtrail spraying in Santa Monica. 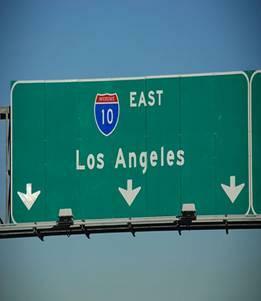 These pictures were taken last week (the week of December 8) around Wilshire Boulevard between 7th and 14th Streets. Does anyone know what these chemtrails contain? Because I certainly don't. I'll write more after I do some research. So far I've heard the following theories: (1) simply harmless contrails; (2) some type of chemical for weather modification; (3) some type of chemical to provide atmospheric protection from unknown cosmic and solar energies; (4) some type of biological agent for some unknown purpose; or (5) an optical illusion of the heated plane speeding through a chilled sky wherein the air crystalizes. None of these theories were formulated by advanced scientists, so our minds may have been warped by comic books where the craziest explanation always made the most sense. Los Angeles Chemtrails Meetup, is about raising awareness, demanding transparency, and stopping the Aerosol Spray Operations taking place, on a near daily basis, over the populations of Los Angeles, the United States, and the world over. We demand an immediate halt to these operations. We demand to know exactly what we have been sprayed with and what the health effects are. We demand publicly open investigations and publicly open hearings. We demand Justice! Thanks for reporting the truth about chemtrails. Anyone who lives near LAX's flight pattern can tell these are not normal flight patterns nor normal aircraft contrails, which we rarely get because the temp and humidity is not usually conducive. There are a couple thousand flights out of LAX every day, and these chemtrails occur intermittently. I could smell the chemicals in the air yesterday. It causes coughing and tearing/stinging eyes and congestion. It is NOT healthy to be exposed. It causes upper respiratory problems and 'flu-like' symptoms. I have seen them and been aware of them since 1997. From the mountains of Malibu, California, at 8:00 am onFriday, November 18, 2005, I watched jets in the skies over Ventura and Los Angles Counties streaking the skies with chemtrails. They have occurred almost everyday since. Some days as many as 80 patterns existed, going from the ocean to 40 miles inland. 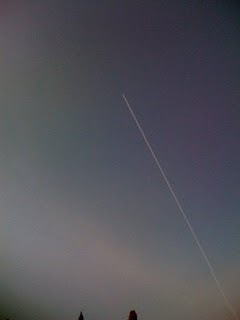 The chemtrails drifted from as far as Oxnard and fall on all Los Angeles County inhabitants. Chemtrails are frequently sprayed directly over all areas of Los Angeles County. They are being reported in most areas of the USA. Nearly daily since Friday, November 18, 2005, chemtrails streaked the skies at Venice Beach, drifting inland over Los Angeles residents. Witnesses have documented and photographed military KC-135's, KC-105 and white unmarked jets spray chemtrails. Airport personnel and pilots confirmed specific commercial airliners leaving the long-lasting chemtrails. Although chemtrails are frequently reported, the US Government continues to deny the existence of chemtrails. March 02, 2009 – Chemtrails over Los Angeles. I live in So. Cal. and have noticed a few things, based on my own unscientific observations: 1.) It has been said that So. Cal.